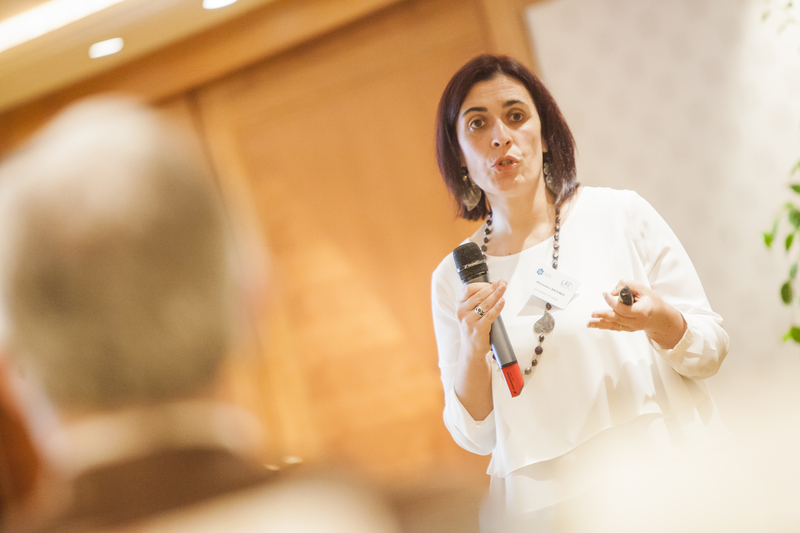 BRUSSELS, December 1, 2014 – Portuguese researcher Dr. Alexandra Antunes was awarded the €100,000 LRI Innovative Science award, one of Europe’s largest research grants for early career scientists, at the award ceremony of Cefic’s 16th Annual Long-Range Initiative (LRI) Workshop in Brussels on November 19, 2014. Dr. Antunes’ (above) winning research proposal investigates improvements can be made in the detection of early stage cancer . She postulates that early stage cancer formation can be detected by studying the binding –by mass spectrometry – of chemicals substances to the human proteins. This new specific biomarking has enormous potential to improve early detection and thereby the chances of successful therapy. Dr. Antunes obtained a degree in chemistry in 1994 at the University of Lisbon and a master of science degree in industrial organic chemistry and a doctorate in organic chemistry at the New University of Lisbon, in 1998 and 2003, respectively. She is principal researcher at the Centro de Química Estrutural from the Instituto Superior Técnico (CQE-IST). Dr. Sabine Langie of VITO (Belgium), who won the award last year, presented the results of her award winning proposal: “Environmental programming of respiratory allergy in childhood: the applicability of saliva to study the effect of environmental exposures on DNA methylation”. Her study found that saliva samples could be used as a biomonitoring method to detect chemical substances that reside in the human body. This new, non-invasive, and quicker saliva method correlates strongly with traditional measures performed via urine and blood samples. This finding has important implications for the future of respiratory allergy testing, especially for children where blood collection is often cumbersome. Klotz added: “The LRI Innovative Science award gives early career scientists complete freedom to develop their breakthrough ideas, find new approaches to tackle risk assessment and help reduce uncertainty as it relates to chemicals safety”. Both the 2013 and 2014 grants were awarded after a selection by eminent European scientists – in collaboration with leading scientific organisations SETAC, EUROTOX and ISES. Designed to recognise outstanding contributions from early career scientists from around Europe, the prize supports innovative research to assess the impact of chemicals on health and the environment more reliably. This year’s LRI workshop included presentations by academics , government officials and chemicals industry experts who addressed a range of critical issues, including new approaches to most effectively harness resources and knowledge to achieve better chemicals risk assessment. The workshop showcased the results and outcomes of several LRI projects completed in 2013and 2014. The impact of the LRI projects, with focus on exposure, biomonitoring, toxicogenomics, sediment transformation, dose-response, and benefit-risk analysis, were discussed. The LRI is currently working to help make it possible to streamline the process of how different stakeholders such as the policy community and the media draw on science and scientific evidence to build arguments that inform their decision-making process as it relates to chemicals safety. Find out more about the LRI annual workshop here.